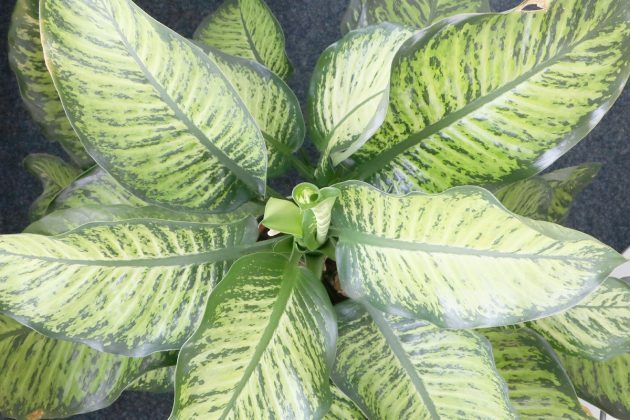 The easy-to-maintain Dieffenbachia is an attractive plant. Its patterened leaves are strikingly beautiful. 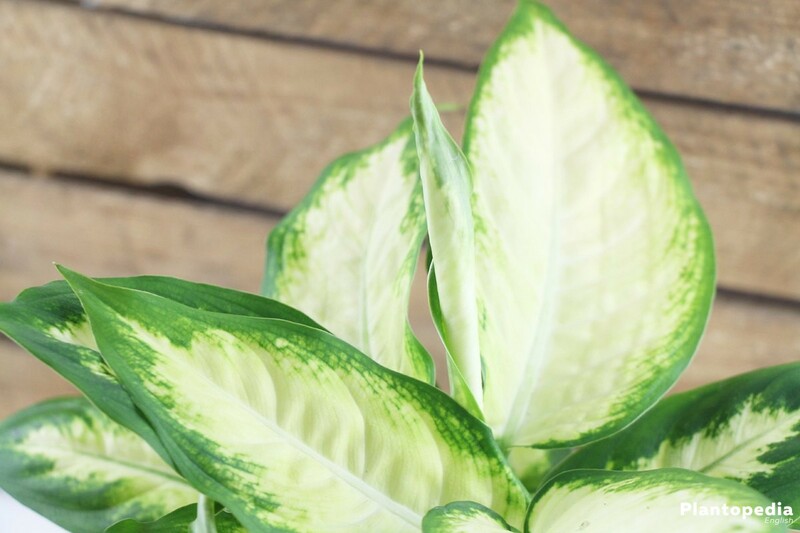 Anyone looking for houseplants with sustaining growth, makes a good choice with the Dieffenbachia. Quite small as a seedling it can be placed anywhere while it should later get a nice location. 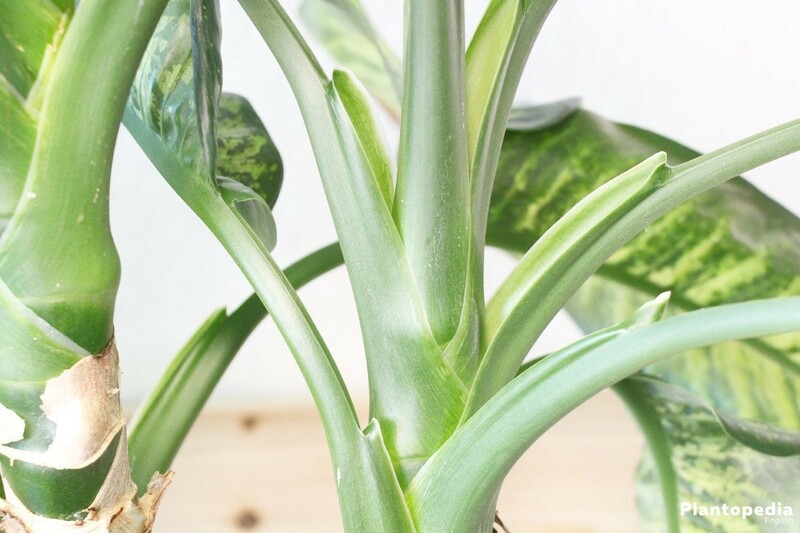 But above all, it is carefree and delivers great joy even to people without green thumbs. 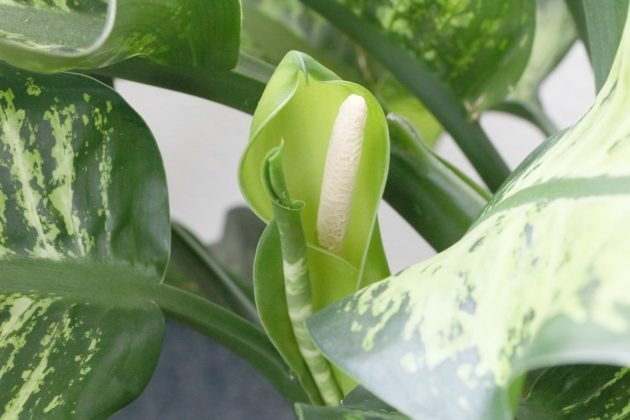 Beware of poisonous parts of the plant! The Arum family are house plants, which have their origin in tropical South America. 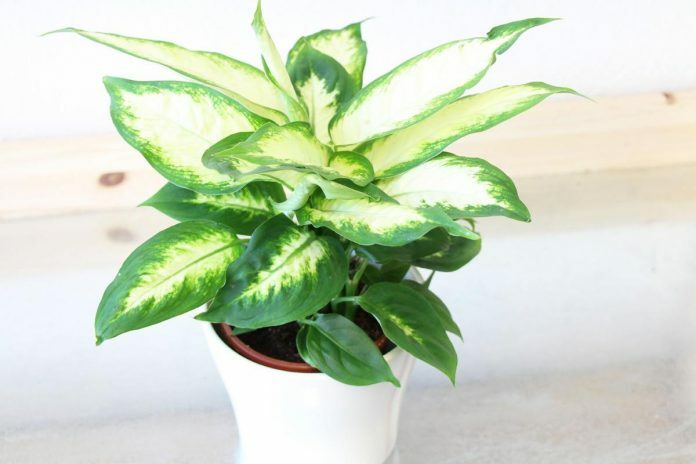 They are also popular due to the easy location search, because the Dieffenbachia also grows at shady locations. 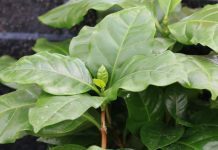 Some of the varieties grow aloft, others in turn in the width. 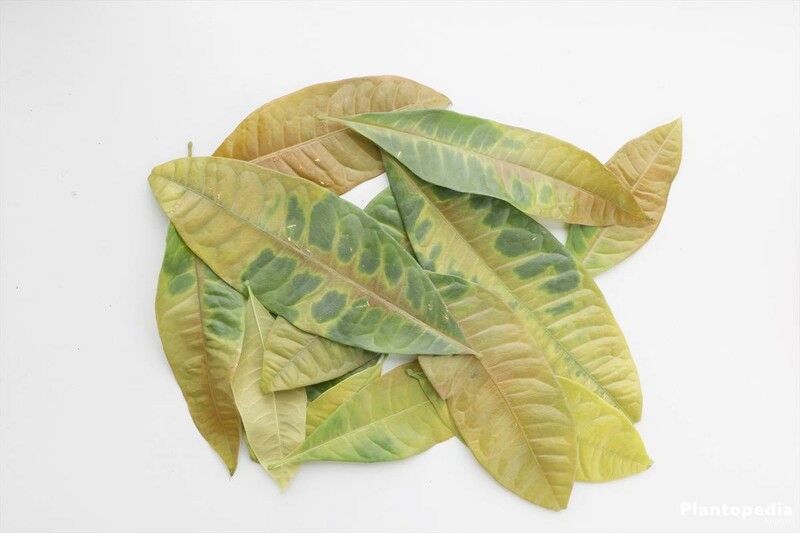 Their different leaf types make them interesting for living room and office. 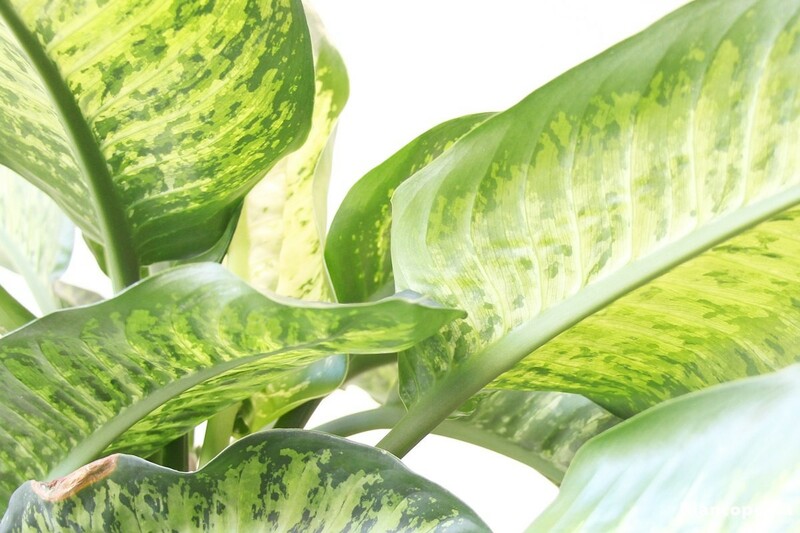 In detailed care instructions, we describe how the Dieffenbachia should be treated. 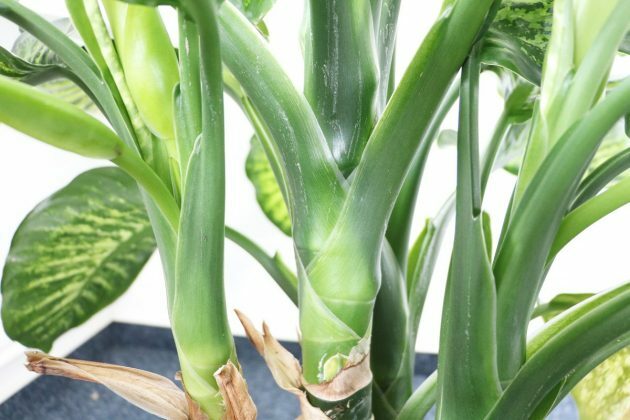 Plant lovers should know that plant parts and leaves of the Dieffenbachia are toxic to pets but also the people. The name “Silence pipe root” probably comes from the 17th century, when slaves were still tortured to make them silent. 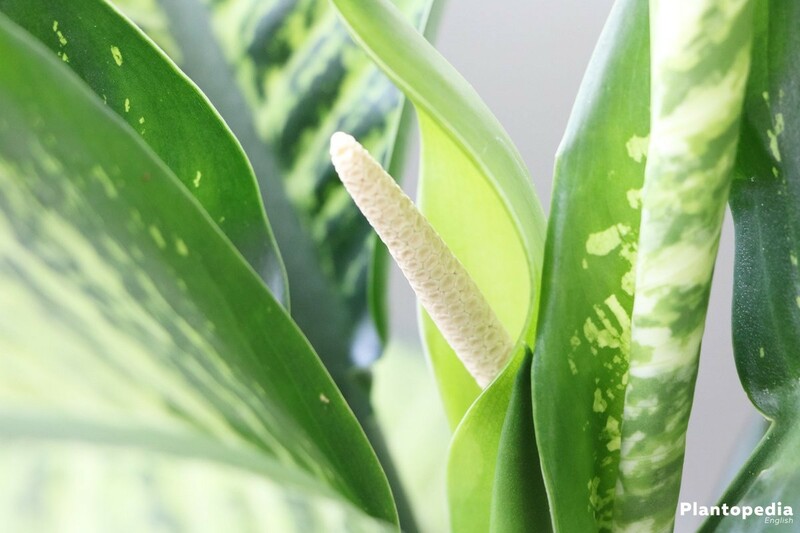 To achieve this, they were forced to chew plants parts of the Dieffenbachia, and then they fell silent, because these parts contain calcium oxalate with smallest needles that are drilled in the mucous membranes in the throat and mouth. Then the slave for some time could no longer speak. 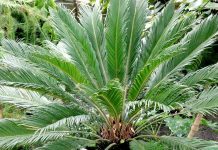 For domestic animals by the nibbling of the leaves it can cause that they stifle. 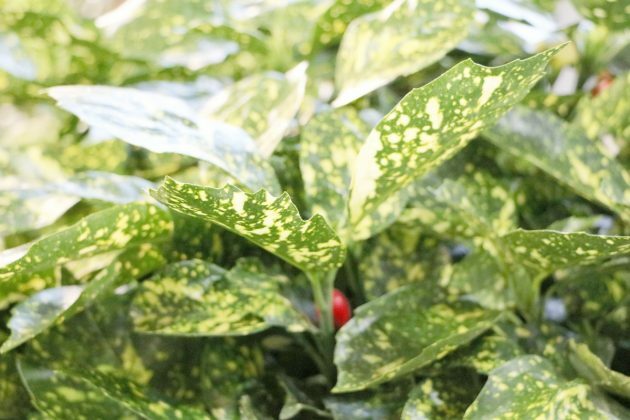 It also contains the Dieffenbachia saponins, alkaloids and glycosides, which can lead to heart rhythm disorders, paralysis, or nausea. When cleaning the blades, the calcium oxalate needles can be shot down and get in the face or even in the eyes trigger and there a chemical burn of the conjunctiva. 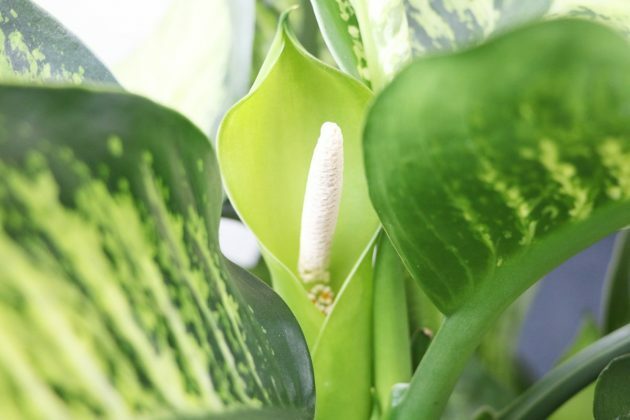 Don’t let yourself scare away by the poisonous plant parts. 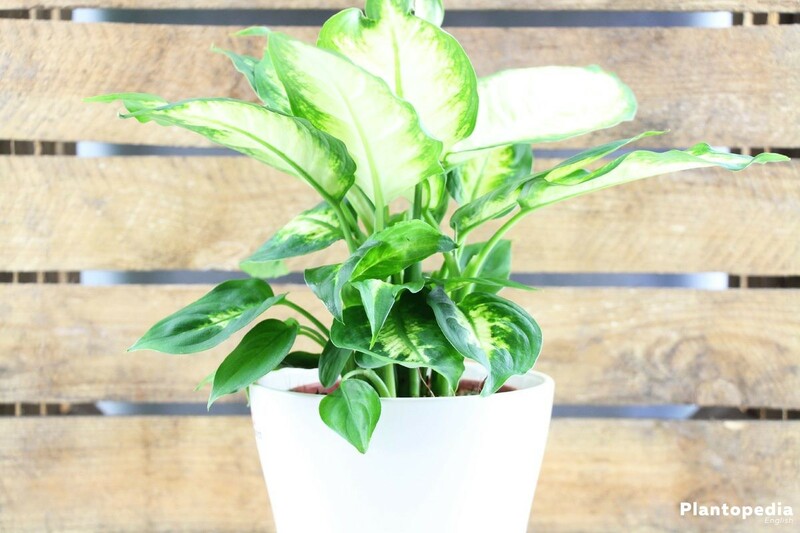 The everyday life with the Dieffenbachia is easier than you think, especially when it comes to the care of this beautiful plant. The southern side of the house is very suitable. Here, the Dieffenbachia gets direct sunlight, this should, however, be without draughts. 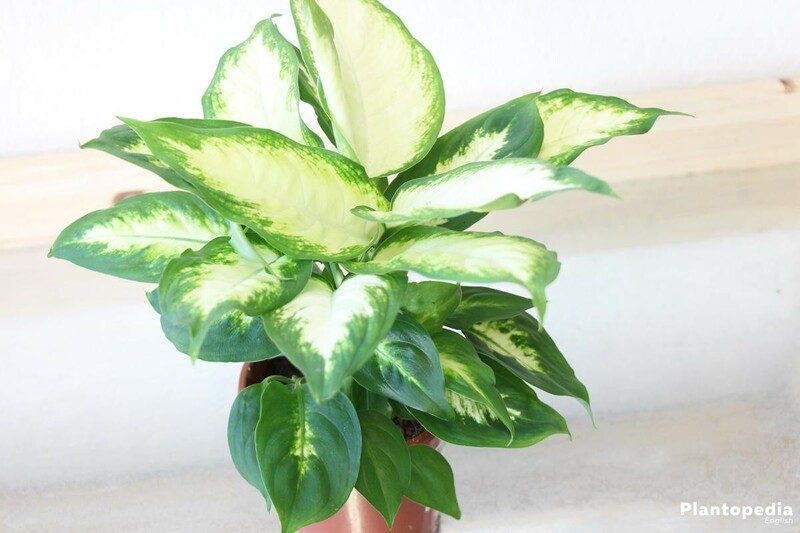 Also an appropriate place in the penumbra is possible and some types of Dieffenbachia are placed even in locations that are not sufficient for other houseplants. The ideal room temperature, however, begins at 15 ° C, temperatures between 18-24 ° C are optimal. 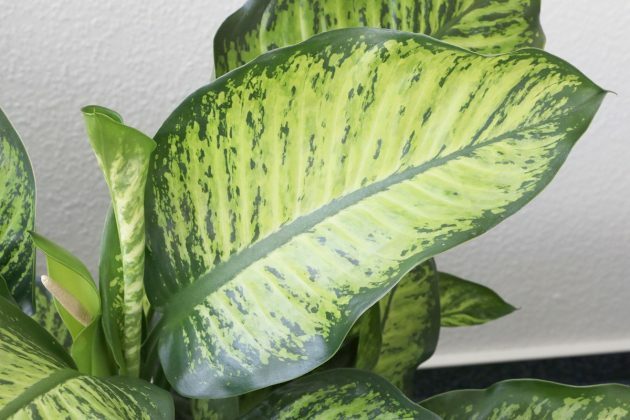 The Dieffenbachia is simple when it comes to the soil. A good planting soil is perfectly sufficient. Alternatively, also potting soil and compost can be mixed. 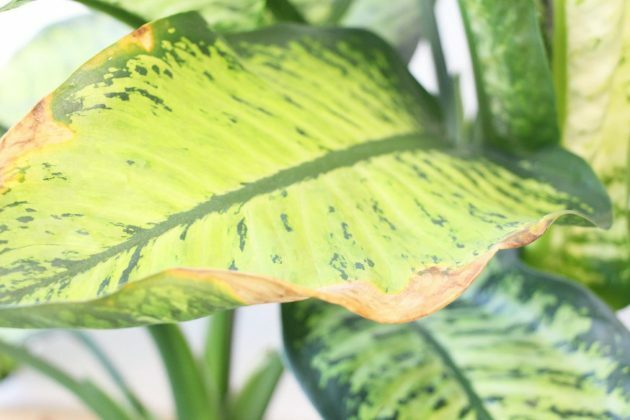 Also rotten leaves and coconut fibres promote growth of the Dieffenbachia. A drain that allows the running of water is important. 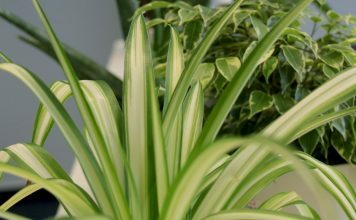 Pay attention to a watering edge from a few centimetres so the water doesn’t drain out of the pot. Hint: Wear a pair of gloves because of the toxics! 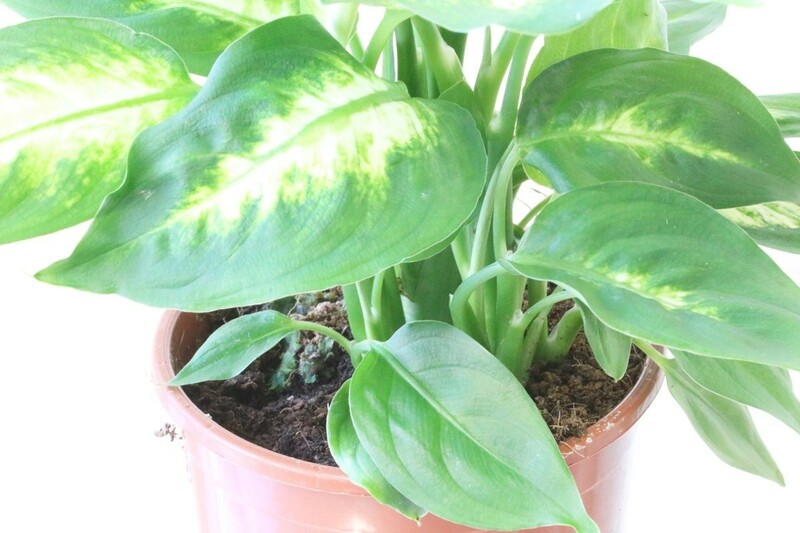 The Dieffenbachia is sold usually in the trade as a seedling or large specimen. 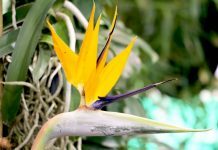 Seeds by flowers are rare, the propagation by cuttings is better. Continue reading in the chapter “Propagation”. 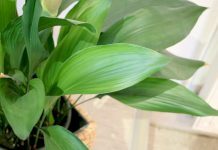 To allow the plants optimal thrive, it is advisable to provide the plants with fresh, good soil after the purchase and possibly a larger pot. 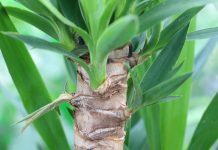 If already now many roots are seen that soon grow out of the soil, an at least two centimetres large pot is the better option. Use good, fresh soil and provide the soil with drainage. Then a layer of soil and the root ball are added. Then the pot is filled up on the sides and watered. After pressing on and watering it may be possible that some more soil must be added. 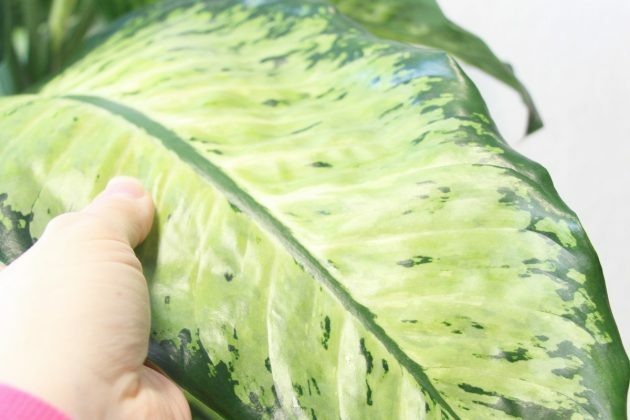 The repotting of the Dieffenbachia is carried out in a similar way. 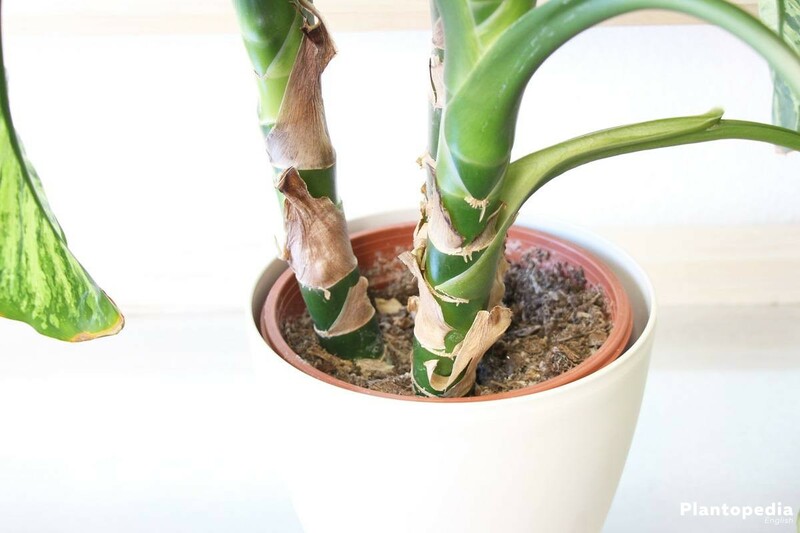 Depending on the growth, the repotting is required once a year or every two years. 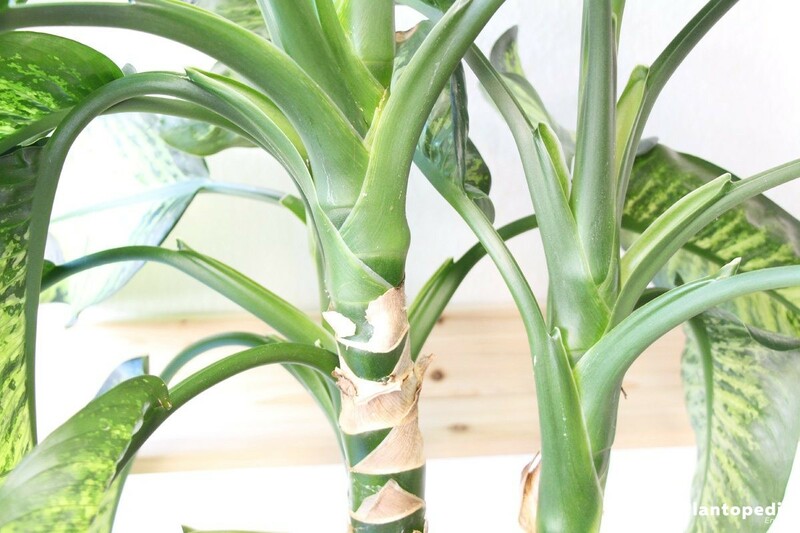 Old, dried roots are removed, the young roots can be shortened a bit with a scissor. 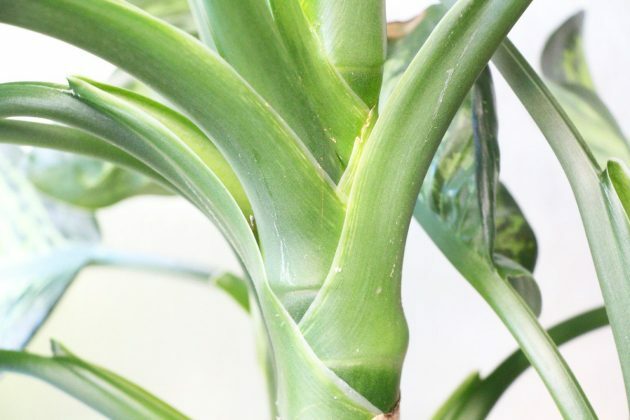 The new pot shouldn’t however be larger than ten centimetres, because the plant otherwise puts its force into the growth of the roots and the leaves develop less well. 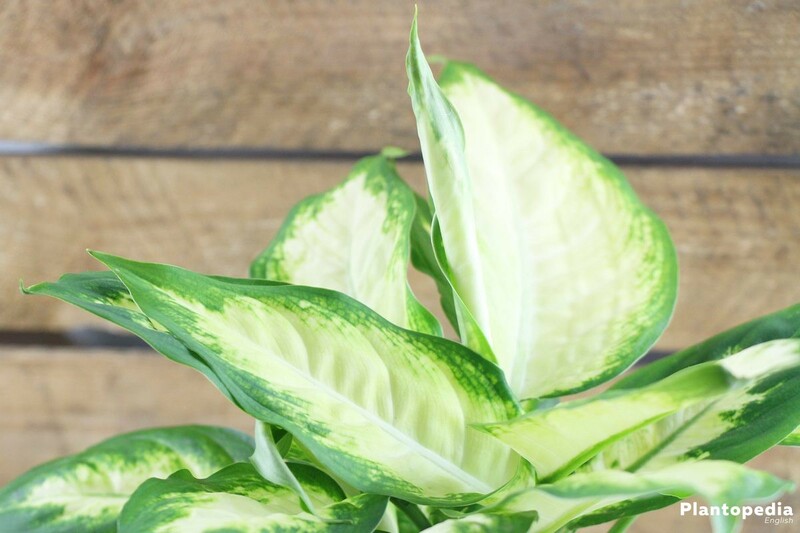 Originally the Dieffenbachia knows none of our seasons. The seasons are characterized by dry and rainy periods. It is necessary to mimic this rhythm as well as possible. 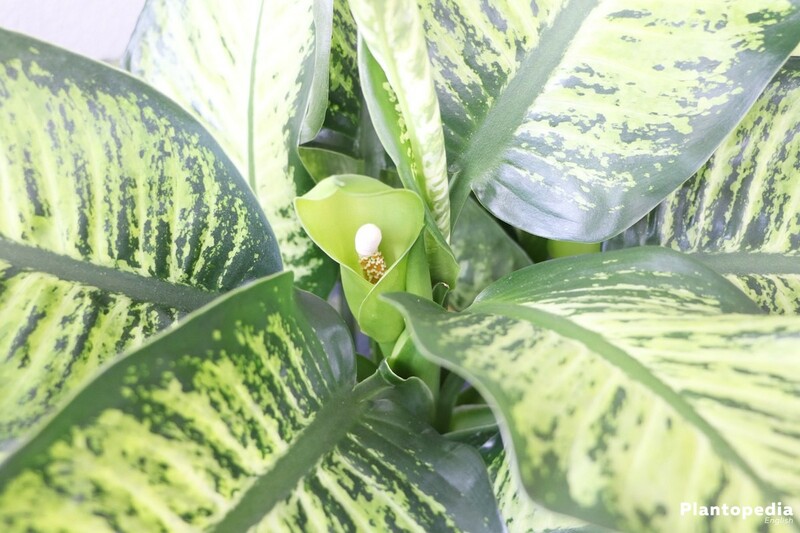 The Dieffenbachia loves a regular watering which does not end in waterlogging. A drainage is therefore of the utmost importance, because the roots can rot otherwise. It is important that it’s watered with stale water at room temperature. If the possibility is given, accumulated rain water is even better. 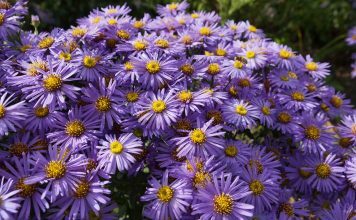 From September, October, when the rest period begins it is watered less. Once the surface is dry, water moderately. 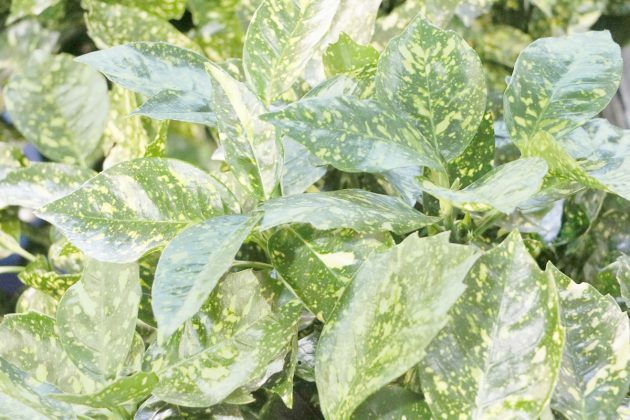 In the warm season, the plant is sprayed several times a week on the leaves, also the spraying is reduced in the winter to maximum twice a week. 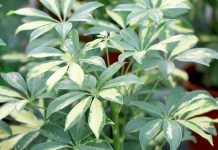 Fertilize every two weeks during the growth period. 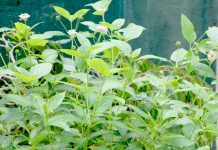 A liquid fertilizer for foliage plants supplied to the water according to the manufacturer is ideal. 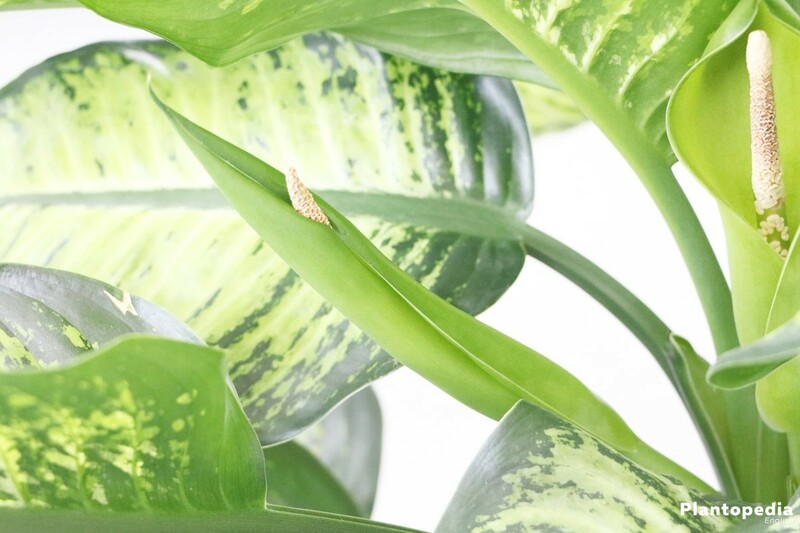 In the stationary phase, fertilize the Dieffenbachia only every six to eight weeks. If you want your Dieffenbachia quite not lavish, do not cut it. Because under good care and ideal site conditions in fact many large leaves can develop in the course of time, which require cutting the plant. 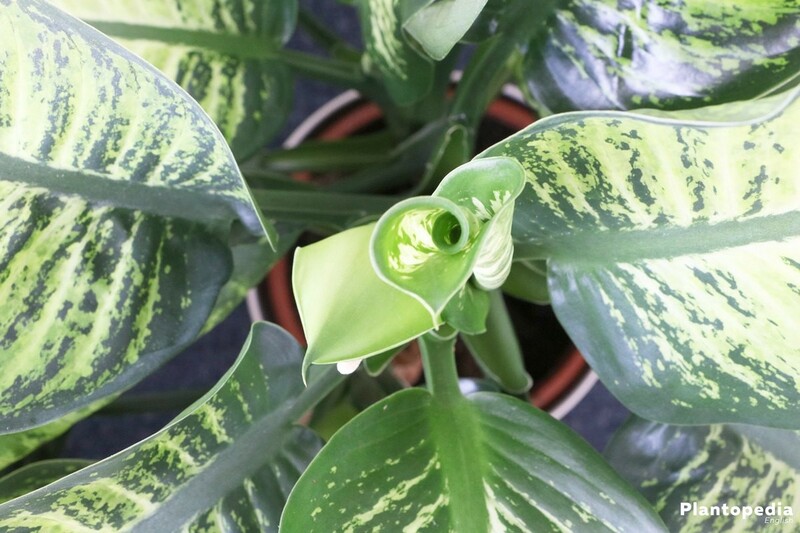 Fortunately, the Dieffenbachia is very robust and tolerates cutting. 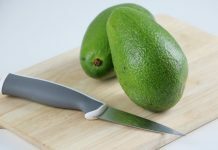 Still use a good, sharp knife and protect yourself. 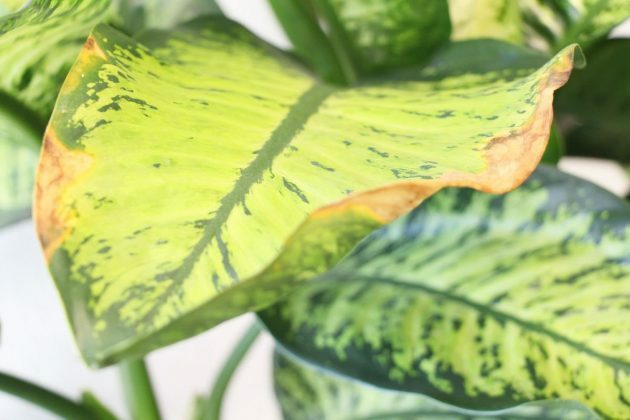 Pay attention to the following instructions, to not damage the beautiful plant. 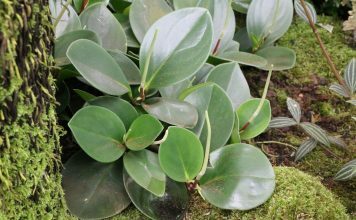 The propagation begins right at the pruning back in the spring. Before you start the work, you put on gloves. 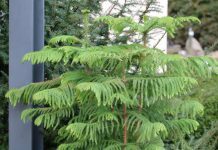 Cut long branches, these are very suitable as head cutting. 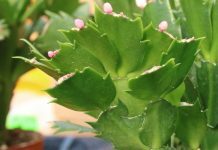 The cuttings are truncated to a length of approximately 10 cm and put in a pot with a mixture of soil and sand. To obtain the required temperature of approximately 25 ° C, a plastic film is pulled on the pot and placed in a bright location. 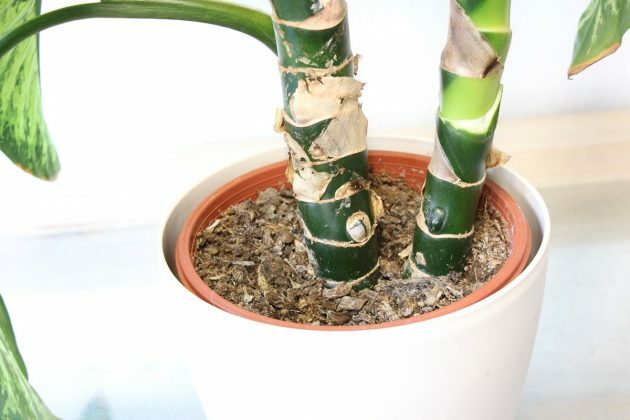 After approximately six to eight weeks roots have formed, then the cutting can be repotted into a pot with propagation soil. Also in the winter months the Dieffenbachia must be placed at a warm, bright space with high air humidity. A humidifier or spraying the leaves make sure that the plant is well supplied. 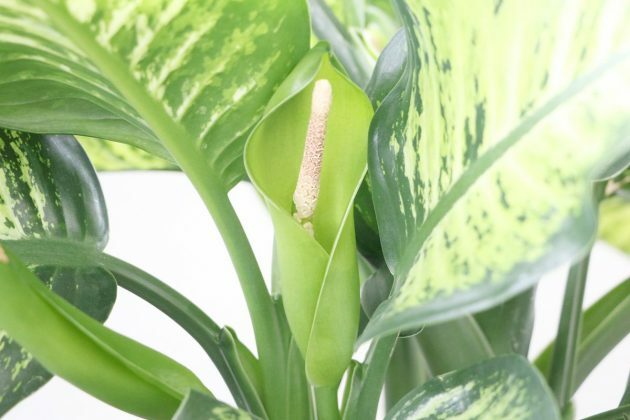 Avoid cold drafts and make sure that the Dieffenbachia while daily ventilation gets no draughts. The room temperature should be at least 15 ° C, then the tropical plant will feel well. 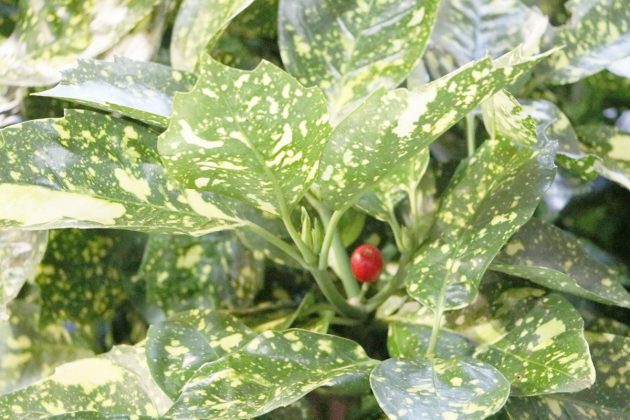 It generally belongs to the robust house plants, which are rarely infested by diseases or pests. 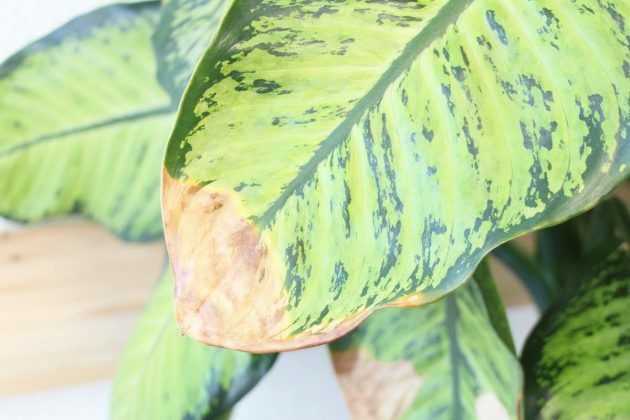 Brown tips are therefore only an indication that the plant is getting too less water. 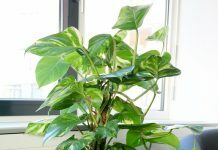 However is the soil wet, it needs a higher air humidity. 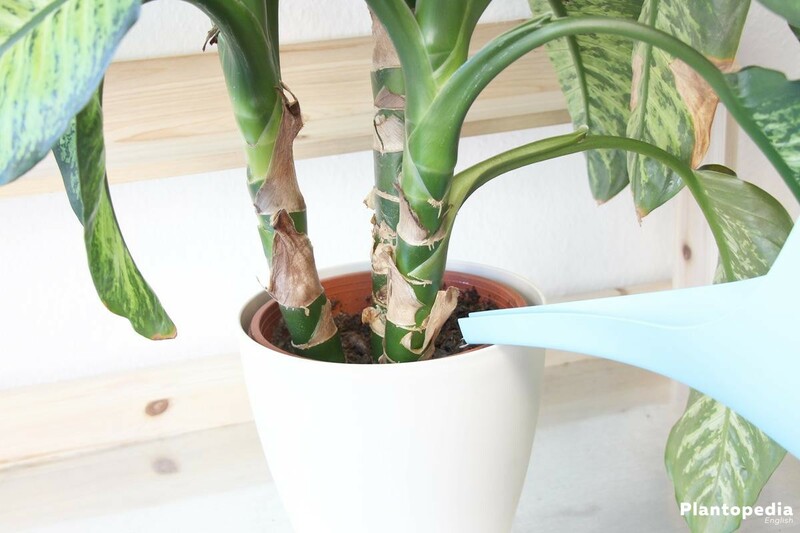 A simple water sprayer ensures that the leaves are moistened, then it will do fine most of the time again. 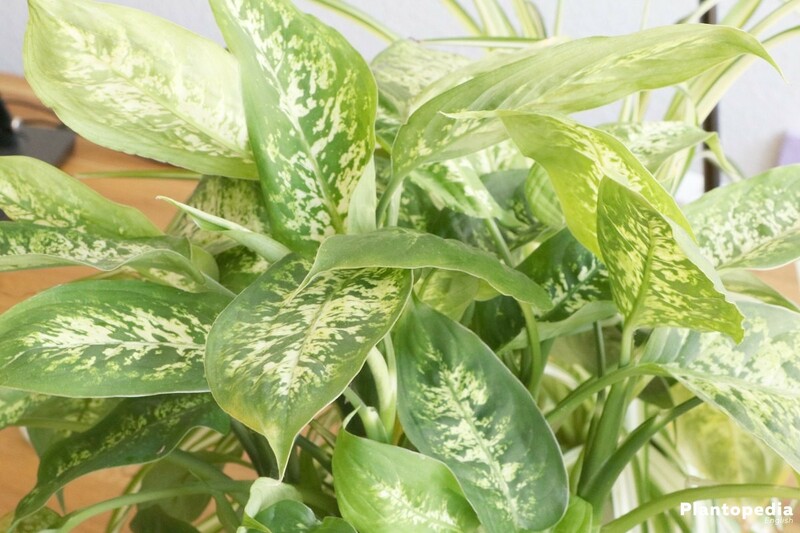 If the plant loses leaves, it maybe has a wrong location or is exposed to draughts. Normally, however the older Dieffenbachia drop their lower leaves. 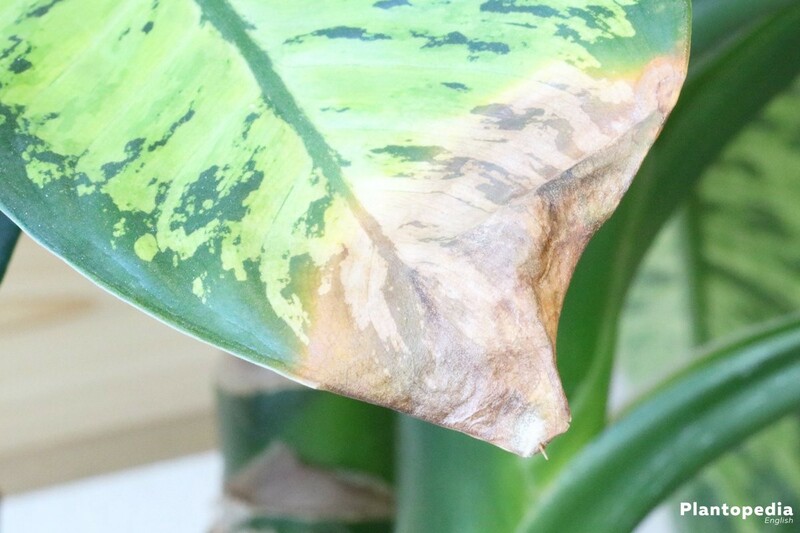 Root rot accrues however by waterlogging or frequent watering. In this case, the soil should be exchanged and are then less watered. Also the Dieffenbachia is not always protected from pests. 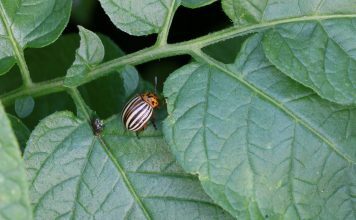 Most pests steer clear of these plants due to the contained toxins, but shield – wool- and mealybugs do not disturb on it also. 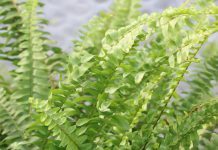 They are easy to spot on their plate, but have the ability to adapt to the colour of individual plants. Immediately isolate the infested plant and place them in a bright but cool room. 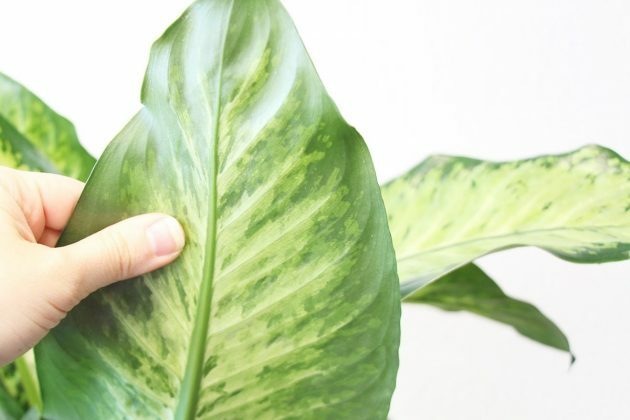 Remove the affected leaves. In addition an upside down shower helps with not very large plants. The water jet dispels the unpleasant lice and the plant is pleased to get an extra portion of moisture. If the lice are recognised directly on the leaves, also a cotton swab soaked in alcohol can help. Alternatively, the classic soapy water is always good advice. 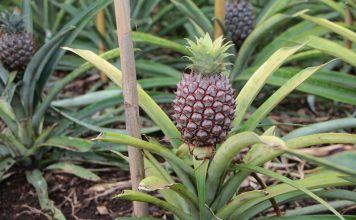 Mix everything well and spray the plant at a distance of two to three days until the lice are gone. Dieffenbachia appear with plain dark green leaves, white striped or with a light pattern. Here we introduce some types.